Vagrant being utilized by Developers and operations engineers for several years. It's often referred to as the Swiss Army knife for development environments. As more network devices are becoming available in a virtual form factor, it's only logical to investigate how we can integrate them into the Vagrant workflow for a full-stack experience. 1. Sign in to your Cisco VIRL account and download the IOSv images. Select the Download VIRL link. Click the Download button for both IOSv and IOSv L2. 2. 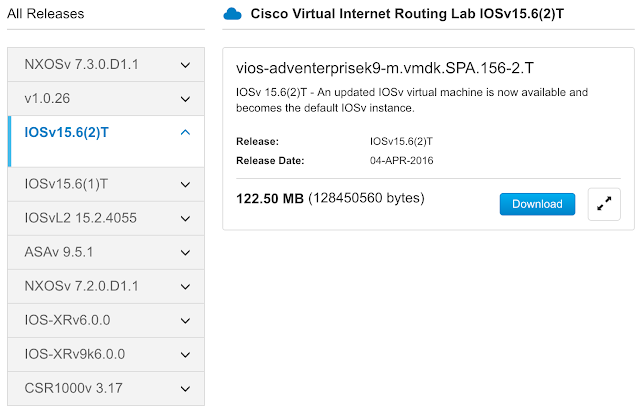 Create the Cisco IOSv virtual appliance base. I will be creating an IOSv (L3) template for my example. The method for the IOSv L2 image essentially follows the same pattern. Click File -> New... from the VMware Fusion menu bar. Select the Create a custom virtual machine option. Select FreeBSD (Other -> FreeBSD) as the operating system. Click the Choose virtual disk... button. Navigate to and select vios-adventerprisek9-m.vmdk.SPA.156-2.T.vmdk. Select Make a separate copy of the virtual disk. 4. Close the VMware Fusion application. We will be working from the command line for the remainder of the tutorial. 5. Add a custom serial port (for management via console connection). Append a serial port device to the virtual appliance configuration file. 6. Start the IOSv virtual appliance. 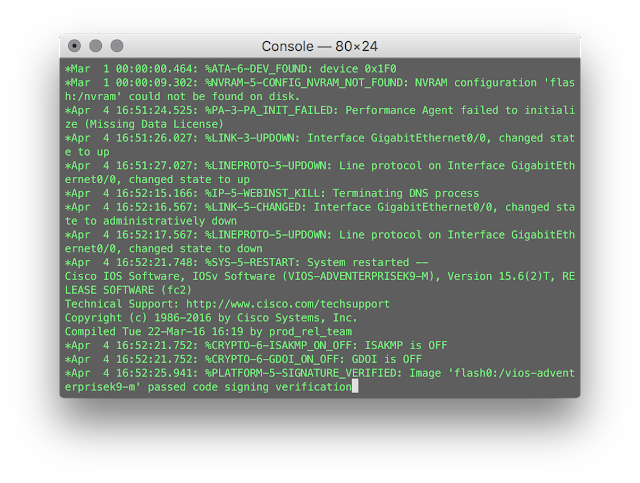 Start the IOSv-L3-156-2 virtual appliance with the vmrun command. The IOSv-L3-156-2 virtual appliance should now be in the running state. 7. 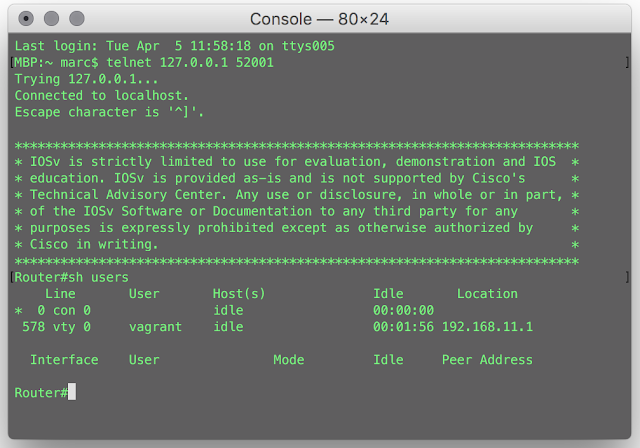 Initiate a console connection (via Telnet) to the IOSv virtual appliance. 8. Establish a baseline configuration for the Vagrant box. Enable AAA and define AAA method lists. Configure the primary terminal line. Configure the virtual terminal lines. Create an EEM applet for regeneration of RSA keys triggered by network interface addition (or deletion). Router(config-applet)# action 2.0 cli command "show ip ssh | include ^SSH"
Router(config-applet)# action 2.2 syslog priority informational msg "SSH is currently \$status"
Router(config-applet)# action 3.1 cli command "configure terminal"
Router(config-applet)# action 3.2 cli command "crypto key generate rsa usage-keys label SSHKEYS modulus 1024"
Router(config-applet)# action 3.3 cli command "end"
Router(config-applet)# action 3.4 cli command "copy run start"
Router(config-applet)# action 3.5 syslog priority informational msg "SSH keys generated by EEM"
9. Stop the IOSv virtual appliance. 10. Create the Vagrant box. Change the current directory to IOSv-L3-156-2. Remove all generated MAC addresses from the IOSv-L3-156-2 configuration file. Create the Vagrant box file with tar. 11. Add the Vagrant box. ==> box: Successfully added box 'cisco-iosv-l3-156-2' (v0) for 'vmware_desktop'! Note: After Vagrant establishes a SSH connection to the remote virtual instance, it expects to talk to a standard shell (e.g., Bash). Since Cisco IOS doesn't provide a standard shell, Vagrant will eventually time out. The current workaround is to adjust the vm.boot_timeout attribute value as included in the example Vagrantfile. Router# printf "The kernel is `uname -s` running version `uname -r`"
or a console connection (out-of-band management) via Telnet. Resume the vagrant machine from a suspended state. We have created a Cisco IOSv Vagrant box with two management interfaces (G0/0 and console). It's not terribly exciting for a router (or switch), but it provides us with a foundation to build upon. I make it up until 'vagrant up' and then...could not be found. Attempting to find and install..